Prefabricated steel buildings are ideal for any contractor or builder looking for flexible cost-effective building solutions. 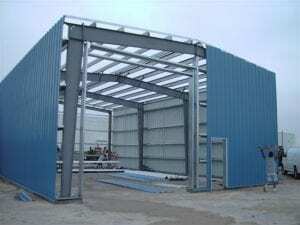 Highly durable, and virtually maintenance free, prefab steel buildings and metal building systems can be customized to capture any desired look or functional use. Additionally, pre-engineered metal and steel buildings greatly reduce construction times and make later expansion easy. The durability of a pre-engineered metal building is a huge selling point. These buildings can withstand the elements – from heavy rains and snowfall to high winds or even tornados and earthquakes. Adding some galvalume – an aluminum compound – to steel panels can prevent rusting to further increase their lifespan. Furthermore, steel buildings are non-combustible, which means they cannot be destroyed by fire. Since pre-engineered metal or steel buildings have no interior columns, their interior layouts are much more flexible than a traditional building’s. This coupled with the option of large overhead, rolling, or sliding doors offers uninterrupted interior space. A pre-engineered steel building has no maximum size, which means it can accommodate anything from a manufacturing plant to a warehouse, office, or retail space. Even better, there are endless width and length extension options to simplify any necessary future expansion. Unlike the construction of a traditional building, which can take several months or longer to complete, assembling and erecting a pre-engineered metal or steel building is relatively quick and easy. If you’re a do-it-yourselfer, every building comes with anchor bolt patterns, a step-by-step erection guide, and detailed assembly drawings. Individual pieces are precut and numbered to correspond with assembly drawings for fast assembly. If you lack the know-how or manpower to comfortably take the DIY approach, you can also find a reliable provider like Steelsmith, Inc. that offers full-service steel building construction services along with design and delivery. Unlike traditional construction, there are seldom any delays in a metal or steel building’s construction process. It’s extremely rare for the assembly of a pre-engineered metal or steel building to incur any extra costs. Steel buildings allow for much better insulation than traditional buildings. This enhanced energy efficiency can significantly reduce heating and cooling bills. Benefits like these, along with technological advances and cutting edge software, have truly expanded the use and capabilities of steel buildings. Is it any wonder why prefabricated steel buildings have risen in popularity in both the private and commercial sectors?